Nothing but three Humber music students and a whole lot of talent make up this band. With a blend of experimental jazz and hip hop, these guys definitely keep your ears on their toes. They're playing a free show tonight with Death From Above 1979 at Nathan Phillips Square as part of the pandemonious Panamania that is filling our streets for the next little while, so I thought I would try them out as I don my DFA shirt for the fourth time. 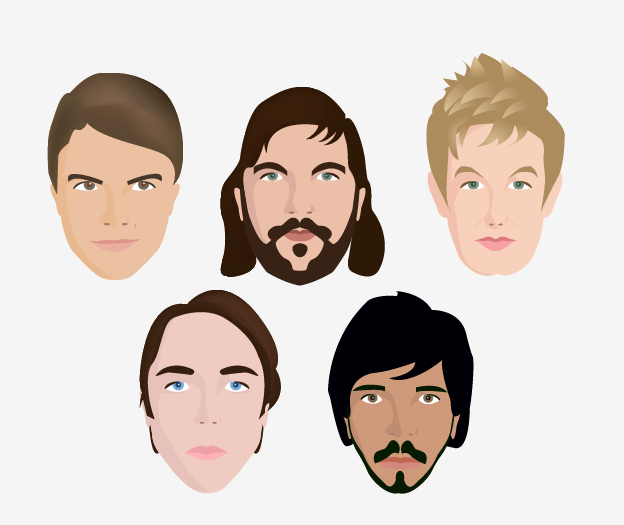 Below is their full first album, complete with a cover of Flying Lotus' Camel (my favourite!). Yes, indeedy-do, I did make a lovely face for our Arlen. And his beard is glorious. This week, I'll be drawing Dan DeCaro's face (second last one!) on Wednesday or Thursday. But there's another goal I've been meaning to accomplish as well...riding my bike this summer! My friend is having a house party on Wednesday, and it's exactly the right distance for me attempt some bike riding skills. 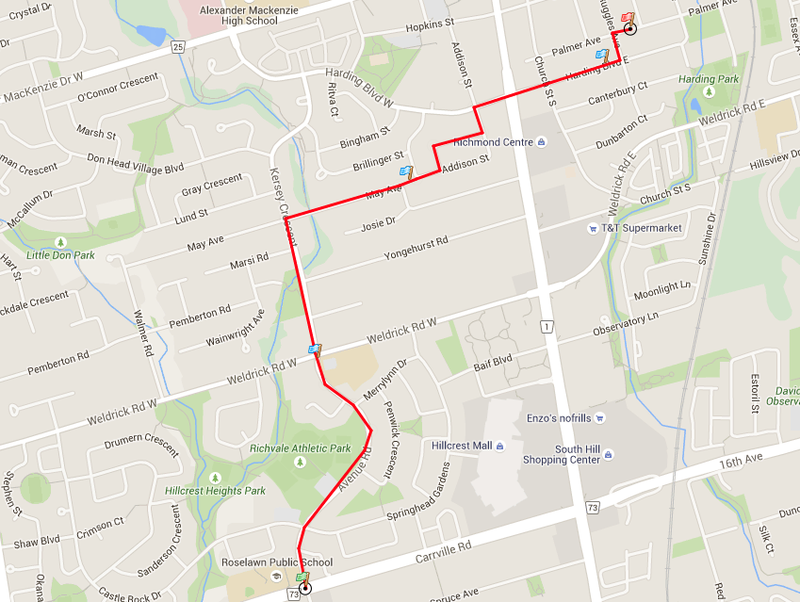 I've mapped my route below, using side streets and all of the bike lanes we have in my dumb town (which is not many). 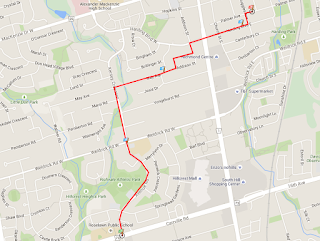 It's just over 4 kilometres one way, which should be doable! 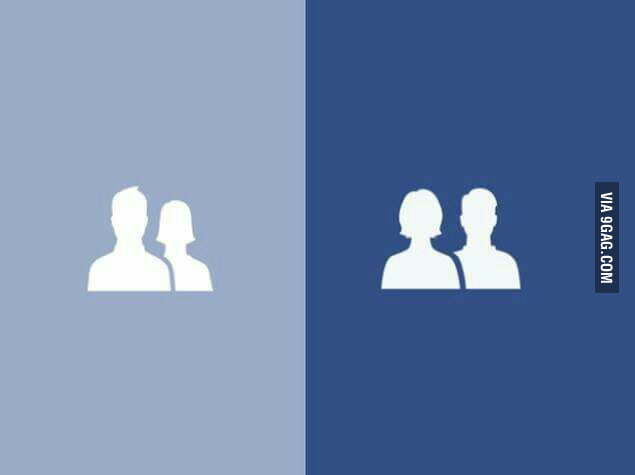 The left is the old Facebook Friends icon, and the right is the new one. You can plainly see that the male icon has been moved behind the female one, and they are both now the same size. I think this is pretty cool in terms of gender equality, but I really have to admit that I never noticed/thought about the fact that the man was in front of the woman. They didn't represent anything separately to me, just the fact that I have friends of both genders. Still though, it's a nice change. It reminds me of the hubbub about the gender selection options when creating a Facebook account. One negative thing I did notice is that the icon is not implemented everywhere on the website. This is the text above a post on Newsfeed. The icon on the right (which you can see has NOT been changed) shows you who the post has been shared with. The options are: everyone (with a world icon), friends (the above icon), and 'only you' (a lock icon). I wonder why it wasn't implemented everywhere. Seems like an oversight. This is especially interesting if you're forever indecisive like me. In an age where everything is digital and we have a smaller need for the printed word, books still seem to be hanging on. Novels especially are still somewhat popular, as they are portable and still have a nice tactile feel to them. I'd argue that the only draw bookstores still have is the recommendations of their employees to guide you to the right read (easily the hardest part of reading books). Enter the new phenomenon of Blind Date with a Book. Bookstores have wrapped books in paper and written some descriptors on the paper to allow patrons to choose books based on what's inside them, not by their covers (as society would have us do). This really streamlines the process of finding a good read, and promotes well-written books that may not have had the luck of being graced with a great cover. And if you still don't like the read, it was only $8.00. You can just throw it in a drawer and never call it again, right?